Decent story, but somewhat predictable. Really well narrated. Enjoyable characters. Good story, but somewhat predictable. The first half of the story was a fun listen. I kept waiting and hoping for one of Dan Brown's jaw dropping twists, but a twist isn't a twist if you know what it is. During a crowded service at a cathedral in Germany, armed intruders in monks' robes unleash a nightmare of blood and destruction. But the killers have not come for gold; they seek a more valuable prize: the bones of the Magi who once paid homage to a newborn savior...a treasure that could reshape the world. If you enjoy history, adventure, and international intrigue, then you would enjoy this book. 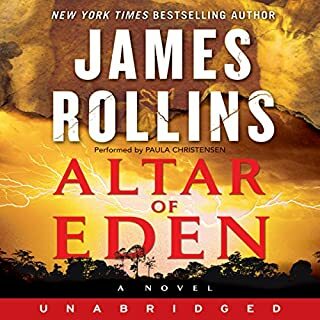 If this is your first James Rollins book, then beware- lost of characters to follow, frequent scene to scene leaps and lost and lots of history. It might take some time getting used to the narrator, but once you do, you will definitely enjoy the book. I guarantee you will have very little difficulty differentiating characters. I also suggest reading the Sigma series in the following order: Sandstorm, Map of Bones, Black Order, The Judas Strain, The Last Oracle and Doomsday Key. Dan Brown is to The Lost Symbol as M. Night Shyamalan is to The Happening. This book simply shattered my high expectations of Dan Brown. 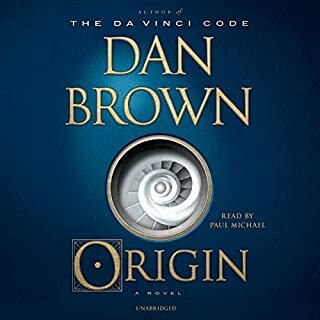 I have read all of Dan Brown's books and this one seems to have been written overnight and I don't believe he read this book before getting it published. There are very few parts that are actually quite good, but they are overshadowed by the rest of the story- making the entire book just flat out useless. What is even more dissapointing is the narration. I almost fell asleep listening to Paul Michael's monotone voice. I hope Dan Brown's next book won't be as dissapointing. 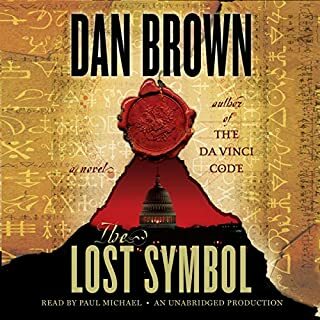 This was the first audiobook I listened to after the dissapointing "The Lost Symbol" and my second ever female narrated book. I will give Paula Christensen a 3.5 star for her crisp voice, engaging narration and not so bad attempt at the Cajun accent. Despite there being more male characters than female, I was able to follow all characters with little to no confusion. This books seems to have a two part story, which I would classify as "The Hunt" and "The survival". Its adventurous, action packed, and scientific. This book is more like a 3.5 than a 3. I also recommed the "Enhanced" audio version!!!!! At Princeton University, a famed geneticist dies inside a biohazard lab. In Rome, a Vatican archaeologist is found dead in St. Peter's Basilica. In Africa, a U.S. senator's son is slain outside a Red Cross camp. The three murders on three continents bear a horrifying connection: all the victims are marked by a Druidic pagan cross burned into their flesh. The bizarre murders thrust Commander Gray Pierce and Sigma Force into a race against time to solve a riddle going back centuries. I was very excited to see that James Rollins had returned with another Sigma Force novel. 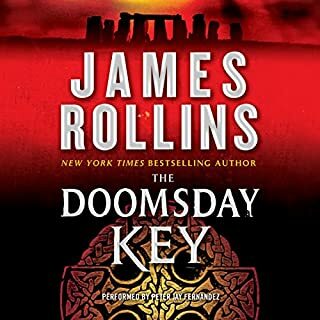 If you liked Black Order and the Judas Strain (Excellent listen), you will enjoy the Doomsday Key. 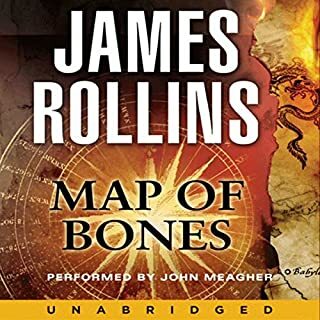 James Rollins is always bridging the gap between fact and fiction, and if you do the research after (while) listening to his books, you will be surprised by how much of it is factual. I was not very pleased with this books ending. I thought Rollins could have done more. He builds up the climax of the story very well, but he does not conclude it with a bang. Nonetheless, if you like international espionage, this is definitely an enjoyable listen. Peter Jay Fernandez did a good job with the narration.